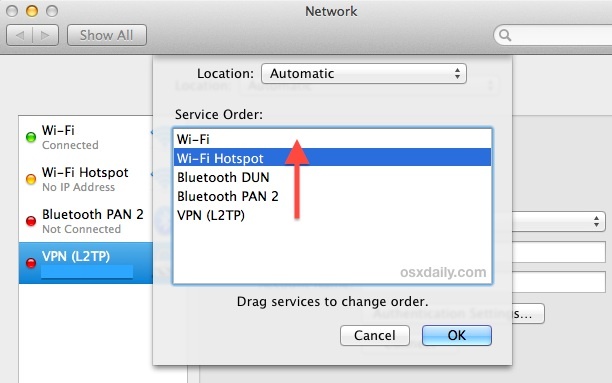 For those of us who use several different types of network connections to get online, you may want to take a moment to set the networking service priority in OS X. This insures that a Mac isn’t connecting through the wrong networking interface when multiple network services are available. 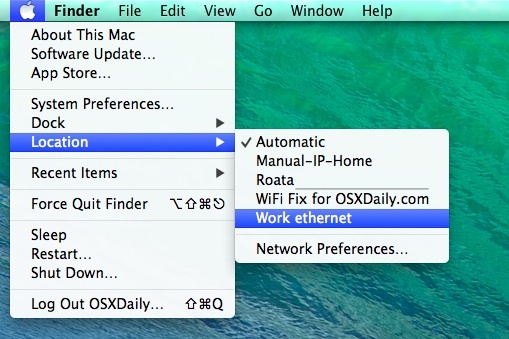 For example, if you have a Mac that is connected to an ethernet network, but also finds available wi-fi networks, you can set one of those to be the preferred connection type. This can also be used to prioritize connections through a VPN, and you can go a step further and set the priority on a per-location basis, which is perhaps the most useful way to use this trick. Note this does not prioritize one wireless network over another, unless the Mac happens to have multiple wi-fi cards available to it with unique interfaces, though that would be a fairly unusual circumstance. Instead, prioritizing individual wireless networks is done through the Advanced Wi-Fi options as described here. Once different locations are set up with their respective service orders, you can now easily switch between them directly from the  Apple menu by pulling down to the “Locations” menu and choosing the desired network location. This is highly recommended for anyone who regularly uses different networks, but laptop users who travel frequently between different locations with their Mac will likely find it most useful.